Nektar is a unique data management platform used by businesses and teams to simplify how they handle their assets and processes, and gain insights into asset-related data so they can identify areas of opportunities, predict possible issues before they happen, and increase their bottom line. Designed with a simple user interface and providing a paperless solution, Nektar organizes all asset information and the associated documents and processes in one place. The data management platform permits users to assign tags with QR codes to their assets so they can easily track them and retrieve any data related to them through QR code scanning. 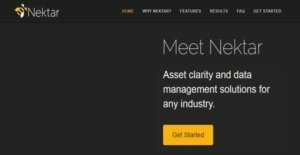 Nektar also provides an asset inspection feature that allows users to track the lifecycle of their assets by keeping a record all events and activities where their assets are being used. The platform automates the creation of work orders which can be instantly generated from asset inspection data, assigned to team members, and completed using a web browser or mobile phone. With Nektar, users will be able to access business insights in real time through the aid of dashboards and widgets that can be tailored to their business needs and workflows. In addition, the platform can generate customizable reports so users can access any information they need in real time and come up with better decisions. The other features included in Nektar are document management, GIS integration, offline mode, asset data sharing, and secure cloud storage. Asset Tagging is among the reliable features offered by Nektar. With this feature, physical tags or labels that contain QR codes can be assigned to specific assets or all of the assets. All the asset information embedded on the tags are securely stored in the cloud. If users want to retrieve and access asset information, all they need to do is to scan the tags attached to their assets. Nektar introduces a very innovative way to organize and visualize asset data. The platform allows users to incorporate their asset data into GIS-based maps. GIS or Geographic Information System is a software used to gather, record, manipulate, and present different types of geographical data. Because Nektar can be integrated with GIS programs and technologies, users will be able to map the spatial locations of their assets. Nektar’s GIS integration capability makes it possible to exchange data between their existing GIS system and Nektar. This means they can export asset data to their GIS system and import geographical or spatial data from the GIS system to Nektar. Task data can be filtered, mapped, and presented in GIS-based maps as well. Asset inspection is another key feature of Nektar. The data management platform ensures that users are able to record and keep track of all past and current asset lifecycle events as well as those events and activities where they can evaluate the performance and traceability of their assets. In addition, they can gather telematics and AVL (Approved Vendor List) data feeds as they perform asset inspections through integration. Nektar includes a work order management feature which is very useful for performing asset management and maintenance activities. Creating work orders using the platform is very quick. In fact, users can generate work orders directly from whatever data they captured during asset inspections. Once they’re done creating work orders, they can assign them to team members. Work orders can be viewed and completed using a mobile app or web browser. Nektar can produce business intelligence and insights in real time. Thus, as assets are being used on-site or in the field, users will be able to track all events and activities that involve their assets as they happen. This is made possible through the aid of dashboards and widgets that are tailored to their own unique business needs and workflows. The data management platform can also help users predict possible outcomes, consequences, and problems through custom reporting. They can access reports that show the exact information they need and pinpoint issues even before they occur. Summing it up, Nektar offers a document management capability wherein files and documents can be linked to the assets defined and stored in Nektar’s database. Files and documents which are saved in desktop computers can be directly integrated into the assets contained in the database as well. If you are considering Nektar it might also be a good idea to examine other subcategories of Best Fixed Asset Management Software collected in our database of SaaS software reviews. There are trendy and widely used systems in each software group. But are they essentially the best fit for your company’s special needs? A market-leading software application may have thousands of users, but does it present what you require? For this reason, do not blindly spend on popular systems. Read at least a few Nektar reviews and mull over the factors that you want in the software such as the price, main tools, available integrations etc. Then, choose a few systems that fit your requirements. Check out the free trials of these products, read online comments, get explanations from the seller, and do your homework systematically. This in-depth research is sure to help you find the best software application for your firm’s specific requirements. How Much Does Nektar Cost? Nektar’s SMB and enterprise pricing plan information is available upon request. Please contact the vendor, and ask for a quote. We realize that when you make a decision to buy Fixed Asset Management Software it’s important not only to see how experts evaluate it in their reviews, but also to find out if the real people and companies that buy it are actually satisfied with the product. That’s why we’ve created our behavior-based Customer Satisfaction Algorithm™ that gathers customer reviews, comments and Nektar reviews across a wide range of social media sites. The data is then presented in an easy to digest form showing how many people had positive and negative experience with Nektar. With that information at hand you should be equipped to make an informed buying decision that you won’t regret. What are Nektar pricing details? What integrations are available for Nektar? Nektar integrates with accounting programs, GIS systems, and many other solutions through its API. If you need more information about Nektar or you simply have a question let us know what you need and we’ll forward your request directly to the vendor.